True home owners also pride in their driveway. 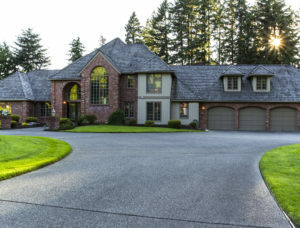 A clean driveway puts an accent on a beautiful home giving lasting, great first-impressions. If you had spent more than your usualy buck into having the American driveway, your prime interests is keeping it at it’s best. There are some weak spots in concrete. It may look like a solid piece but concrete is porous. It is combined with cement mix, gravel and sand and once it’s laid, you are left with tiny holes on the surface. Grime, dirt, mold, bacteria, you name it, even animal crap will fill those holes. These stains are what causes your driveway to deteriorate. Now what gave your visitors great impressions of your home, only ends up with a slab with more patches of stains to add on. Do not settle by accepting that you spent a lot to be left with crap. The simpliest answer is Power Washing. With the right professional equipment at hand, you can keep your American Driveway up to par or even raise the bar. It can get rid of those ugly stains that always gives you a cringe inside everytime you look at it. Your neighborhood brothers are ready to service you for concrete driveway cleaning. Passerbys and neighbors will definitely envy your property. After the raining season, your driveway can accumulate Algae. Check out What is Algae and What Can You Do About it?